Gay Clubs in Calgary as far back as 1939! Back at the University of Calgary archives this week, looking at old theses – the one’s that had to be manually typed with splotchy typewriters! 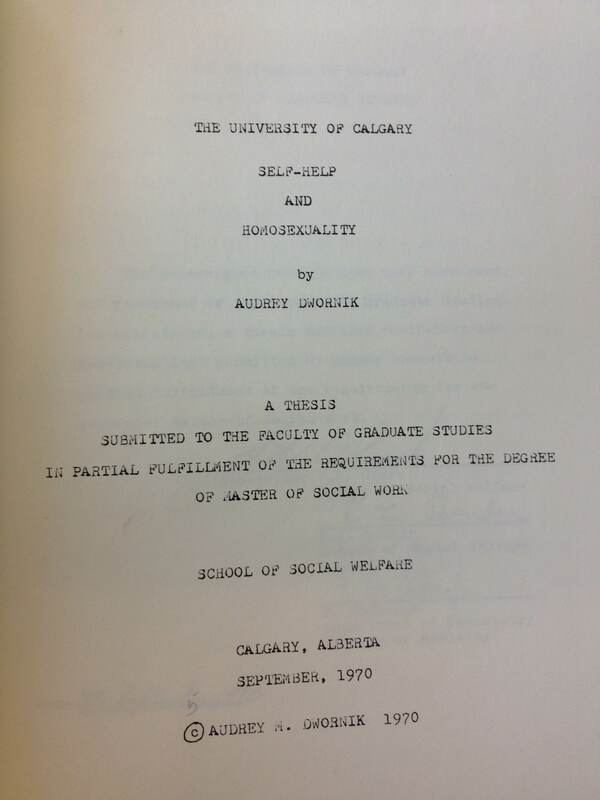 Gold was struck in finding Audrey Dwornik’s, Master of Social Work thesis titled: Self-help and Homsexuality (1970). There were Pansy Clubs in many North American cities, a caberet-style phenomenon that sprouted in New York and spread. Who knew it had made it all of the way to Calgary, whose population in 1939 was 85,726! Check out this link to Pansy Clubs of the 1920s and 1930s, featuring the song, “Masculine Women, Feminine Men” (1926) Fox-Trot, played by the Savoy Havana Band. This entry was posted in Gay history and tagged Calgary, gay, Gay history, pansy club, queer, University of Calgary. Bookmark the permalink.